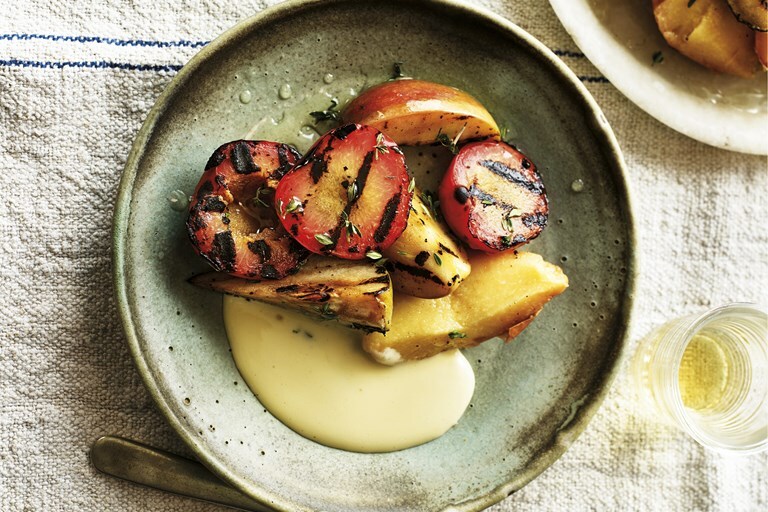 If you're looking to breathe new life into your barbecue repertoire look beyond the usual burgers, steaks and sausages and try Ben Tish's stunning grilled fruit recipe, served with creamy honey sabayon and a sticky thyme syrup. This recipe uses a range of firm autumn fruits, but you could substitute your own seasonal favourites, such as peaches, if making this dish earlier in the year. Autumn-time sees an abundance of delicious fruit to enjoy, such as apples, pears and quince. Because these are slightly more robust, they work particularly well grilled on the barbecue. The thyme may seem an unusual edition in a dessert recipe, but its fragrance goes brilliantly with the fruit and sweet honey sabayon. For the sabayon, whisk together the egg yolks, Marsala, honey and thyme leaves in a large heatproof bowl and set over a pan of simmering water. Ben Tish was the chef director of the Salt Yard Group until early 2017. His latest book, Grill Smoke BBQ, aims to encourage people to think creatively when barbecuing no matter what sort of equipment they're using.